I hate writing about Linda Harvey of Mission: America1. The woman has some form of personality disorder coupled with a diminished intellect. The result is an incoherent and stupefying mix of homophobia and transphobia. While her operation is a hate group she is not really a hate group leader. That would require something on a grander scale. A Christian columnist and commentator says tomorrow's student protests supposedly against bullying are, in fact, themselves bullying students who oppose the homosexual lifestyle. 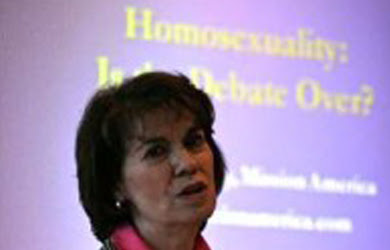 Linda Harvey of Mission: America says "Day of Silence" – a nationwide public school observance taking place on Friday – is a propaganda technique used by adult homosexual activists and gay student clubs. While DOS proponents speak out against bullying, at the same time, says Harvey, they bully conservative and Christian students opposed to both student harassment as well as homosexuality. That syllable salad apparently means something to Ms. Harvey and Mr. Kellogg. Neither is particularly eloquent nor capable of explaining exactly how these Christians are supposedly bullied. Nor, for that matter, do I understand how one is opposed to a sexual orientation that one disapproves of because of ancient chronicles of dubious provenance. "These are two unrelated concepts," she tells OneNewsNow. "You can oppose homosexuality and oppose bullying – there's nothing inconsistent about that, and that is the Christian position essentially. We don't want anyone to be harmed ... and one of the ways they are being harmed is through homosexual and transgender behavior." Rather than being caught up in the frenzy of the facade about bullying, Harvey suggests parents consider keeping their children home that day. That is certainly a responsible attitude. Keep your kid home from school because … Because of what? The Day of Silence has been around for some time and it still hasn't turned any teens gay. Moreover, I have no idea why she thinks that this is some sort of facade. Day of Silence is an individual expression by individual students and while it is organized through GLSEN the organization is not a participant. Schools hosting dances for homosexual students; and presenting "gay"-themed stage productions (e.g., The Laramie Project) and movies (e.g., Brokeback Mountain). That all sounds so terribly sinister. Perhaps Harvey has some affinity for Russell Henderson and Aaron J. McKinney, Matthew Shepard's murderers and the subject of The Laramie Project. 1 In point of fact the entity no longer exists, at least not as a not-for-profit. Mission America filed its tax return incorrectly as a private foundation. In March of 2016 it filed a Final Return for calendar year 2015 showing self-funded revenues (provided by Mr. Harvey) of $18,250. It is no longer included in the IRS Business Master File (which I maintain in a local database). I guess that they weren't taking in enough money to justify maintaining a 501(c)3.